Each year, we recognise volunteers who have made a significant contribution to our mission by inducting them into our Volunteer Hall of Fame. We first introduced the Make-A-Wish Australia 'Hall of Fame' Award in 2005, as a way to acknowledge our most fabulous volunteers. In 2007, the Award was renamed in honour of Aidan McCann, a former wish child and Melbourne branch volunteer who sadly lost his battle with cystic fibrosis in late 2006. Aidan himself was a joint 2007 winner in acknowledgement of his passion and commitment to Make-A-Wish. See who else has received the Aidan McCann Award, and been inducted to our Hall of Fame, below. Emma from our Western Sydney Branch had been volunteering for 9 years in 2018 – holding many roles over that time. She has been integral in leading cross-branch collaboration all over Sydney with combined recruitment drives, the inaugural 2018 Sydney Gala Ball, and the establishment of the South-West Sydney Branch. Congratulations Emma - and thank you for making a life-changing difference to countless wish children, their families and communities! With a doctoral thesis on how to motivate volunteers, helping others is what Rambo is all about. As a volunteer at our Perth Branch since 1999, Rambo has positively impacted the lives of more wish children, families and volunteers than we can count - spreading good vibes everywhere he goes. Christine was recognised in 2016 for being an invaluable volunteer at our Western Sydney Branch, where she had supported more than 126 wish children over 6 years with an infectious enthusiasm for each and every wish. Known for going the extra mile and always making people feel valued - her positive attitude and passion remains an inspiration. With more than 18 years as a Make-A-Wish volunteer, our National Patron Robyn Moore lives and breathes our values. In 2015, she was recognised by her peers for going 'above and beyond' to inspire volunteers, office staff and the wider community alike! Find out more about Robyn and her Make-A-Wish ambassador role here. Paul and Lyn's long involvement with our cause began when, as parents to critically ill children Emma and Brett, they experienced the power of a wish themselves. Emma and Brett sadly passed away, but Paul and Lyn's support continued in their honour, making the wishes of other children with life-threatening illnesses come true. Their selflessness and dedication is truly awe-inspiring. Pam joined our Goulburn Branch back in 2006 - making an incredible 3-hour round trip every month to attend branch meetings. She was instrumental in establishing our Wollongong Branch in 2010, and through her inspiring, inclusive leadership, the branch has continued to thrive today. Pam was recognised in 2013 for a passion that's beyond question, and her flair for fostering strong relationships with community partners, families and her fellow volunteers. Christine joined the Mandurah-Rockingham Branch in 2003, and her many achievements were recognised in 2012. To name just a few, she had built networks and relationships with local supporters, welcomed new volunteers, and helped to open the local Wishing You Well store. Yvonne was the longest-serving member of our Mackay Branch (20 years!) when she received her Award in 2011 - also receiving an Order of Australian Medal for her incredible commitment. 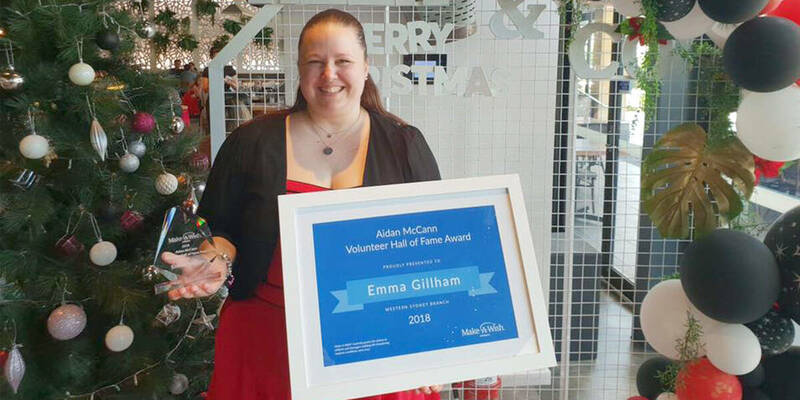 She was recognised for taking on multiple roles and impressing Make-A-Wish volunteers and teams alike with her passion, leadership skills and impact. In 2010, Joan has been a volunteer for more than 15 years, serving as our Burnie Branch President for most of this time. She was also twice recognised by Burnie City Council as a 'Volunteer Legend' (in 2002 and 2007) for her tireless community efforts. In particular, the Aidan McCann Award acknowledged the strong partnerships Joan had built with local businesses, schools, media and parliamentarians in support of Make-A-Wish. Frank was a founding member of the Adelaide Branch, with a 23 year tenure at the time of this Award. He'd held numerous branch leadership positions over that time, and was a positive role model across our organisation, even representing volunteers on the Board. Even on holidays, Frank was known to fundraise for Make-A-Wish, with an enthusiasm that never wanes. As his nominator mentioned "He never stops, yet always gives his best." Pat's 2008 award coincided with 14 years of service, including 12 as our Bundaberg Branch President. While fostering great local connections and support, she also helped establish our Fraser Coast Branch, earning her two additional nominations in 2008 for the Australian of the Year and Premier's Award for Queensland Seniors. Her branch volunteer peers said Pat was always first to arrive at meetings, and helped make every volunteer feel like the most important part of the organisation. Aidan was a former wish child and Melbourne volunteer, who tragically lost his battle with cystic fibrosis in late 2006. In 2007, he was honoured with an induction to our Hall of Fame, and our annual Award was also renamed in his memory. In an emotional speech, our joint 2007 winner Sylvia Rouleston paid tribute to her colleague: "Aidan was a wonderful young man who lived his life to the full, while also giving so that other children's lives could be filled with joy. I feel so privileged to be the first recipient of this award in his name." The amazing Sylvia Rouleston, President of the Hobart Branch at the time, was recognised for her significant contribution in 2007 . Sylvia had led a very successful volunteer branch for 16 years, introducing Robyn Moore (our National Patron) to the organisation, and building awareness across Hobart and surrounding regions. As the President of Port Pirie Branch in 2006, Rosa-Lee was recognised for providing strong leadership to the branch, helping it punch above its weight through her passion and commitment. Her many achievements included fostering the creation of two further SA branches (Whyalla and Yorke Peninsula), mentoring other Presidents and volunteers across the state, and co-establishing the first SA volunteer conference. As our inaugural Volunteer Award winner, Mary had served 15 years with the Gold Coast Branch in 2005 - when she was recognised for the impact she made on her peers, wish families and the wider community. Visiting the Gold Coast's theme parks is an eternally popular wish, and Mary hosted countless local and international wish families, acting as their main contact point during their stay and ensuring every child's wish experience was totally unique and unforgettable.